Nestle Allen’s confectionery has the audacity to revise its products range and reduce the variety of shapes from which the public can choose to consume copious amounts of sugar and food colour. Australia is collectively outraged. This, on the back of Allen’s reducing package and product sizes. Killer Pythons were reduced by almost half in late 2014, making them less python and more garden worm. Based on dropping sales figures particular products have disappeared from the shelves. People, who have clearly stopped buying the product then get outraged that the coloured sugar product that the once enjoyed as a child but have not purchased in years will not be available for them to not buy in the years ahead. Bowing to the power of the internet; a dark hole created by people sitting in dark holes complaining about things other people are doing whilst not actually doing anything themselves and specifically not buying Allen’s lollies. Allen’s are bringing back Jelly Tots. 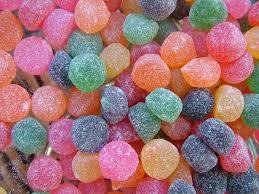 There are two styles of Jelly Tots, regular and Tangy. Tangy appear to be the more traditional style with additional sugar added to the outside of the jelly ball. You can never have enough sugar. With sugar now being a major social faux pas and nutritional no-no. Once promoted by the medical professions as a dietary bonus to combat weight gain it is now seen as a major contributor to obesity. Despite this, the social demand for more sugar options has won the day. In the same vein I want to start a campaign to bring back the “Big Boss”. The caramel candy cigar was readily available in corner delis and school canteens in the ‘70s and ’80s. They were much more sophisticated than their smaller cousin “Fags”, the lolly cigarette. Fags, suffered the indignity of having their name changed to “Fads” in an act of political correctness. I am unsure what the perceived risk of continuing to call them Fags. Were people concerned that children who consumed them would turn gay, or that it would encourage gay children to smoke, or turn all smokers gay. Either way, the lolly cigarette was never competition for their caramel cousin. Both cigarette and cigar lollies originally had red coloured sugar on one end to replicate the burning end of the tobacco product. These were removed from both products years before they started to disappear altogether from the shelves. Polly Waffles, another Nestle product, should also be reintroduced to the shelves. The combination of wafer, marshmallow and chocolate were as light and delicious as the shape of the chocolate bar was hilarious. In the same way that Big Bosses and Fags did not really encourage smoking or homosexuality, Polly Waffles did not promote people pooing in the pool.